Best dua/prayer for removing grief and sorrow from your life: Grief and sorrow eat the victim from inside and leave them at the mercy of others as they are unable to maintain their consciousness. Islam has armed us against grief and sorrow, and there are several powerful duas-prayers to live a worry-free life. Remembrance of Allah is the thing that keeps us in constant bliss and peace of mind, but our ego is the real culprit that keeps throwing us off our spiritual path. A hadith has mentioned the power and effectiveness of these beautiful kalima and this brings us to the reality that acknowledging Allah and His power in the face of grief, sorrow and worry is the remedy. Whenever you feel grief over anything or any situation or for any person, start reciting this dua/prayer comparing this problem with Allah. It will be like pitting this problem (of grief and worry) against Allah and the logical answer your mind will come up with is that Allah overpowers every thing, which also includes grief and sorrow. 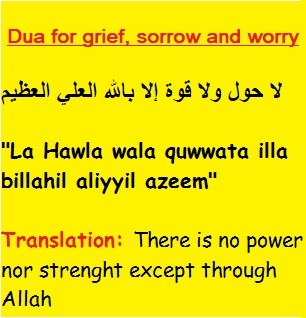 The hadith mentions that the lightest problem this dua fixes is "grief and sorrow." You can imagine the power of these words - if the lightest and least serious problem is grief and sorrow then what wonders this prayer can do to you. It is a complete package to happiness and ease in your life plus the rewards in the hereafter are unimaginable.